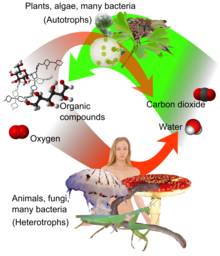 Aerobic respiration (red arrows) is the main means by which both fungi and animals utilize chemical energy in the form of organic compounds that were previously created through photosynthesis (green arrow). The negative ΔG indicates that the reaction can occur spontaneously. The potential of NADH and FADH2 is converted to more ATP through an electron transport chain with oxygen as the "terminal electron acceptor". Most of the ATP produced by aerobic cellular respiration is made by oxidative phosphorylation. This works by the energy released in the consumption of pyruvate being used to create a chemiosmotic potential by pumping protons across a membrane. This potential is then used to drive ATP synthase and produce ATP from ADP and a phosphate group. Biology textbooks often state that 38 ATP molecules can be made per oxidised glucose molecule during cellular respiration (2 from glycolysis, 2 from the Krebs cycle, and about 34 from the electron transport system). However, this maximum yield is never quite reached because of losses due to leaky membranes as well as the cost of moving pyruvate and ADP into the mitochondrial matrix, and current estimates range around 29 to 30 ATP per glucose. Aerobic metabolism is up to 15 times more efficient than anaerobic metabolism (which yields 2 molecules ATP per 1 molecule glucose). However some anaerobic organisms, such as methanogens are able to continue with anaerobic respiration, yielding more ATP by using other inorganic molecules (not oxygen) as final electron acceptors in the electron transport chain. They share the initial pathway of glycolysis but aerobic metabolism continues with the Krebs cycle and oxidative phosphorylation. The post-glycolytic reactions take place in the mitochondria in eukaryotic cells, and in the cytoplasm in prokaryotic cells. Out of the cytoplasm it goes into the Krebs cycle with the acetyl CoA. It then mixes with CO2 and makes 2 ATP, NADH, and FADH. From there the NADH and FADH go into the NADH reductase, which produces the enzyme. The NADH pulls the enzyme's electrons to send through the electron transport chain. The electron transport chain pulls H+ ions through the chain. From the electron transport chain, the released hydrogen ions make ADP for an end result of 32 ATP. O2 attracts itself to the left over electron to make water. Lastly, ATP leaves through the ATP channel and out of the mitochondria. Starting with glucose, 1 ATP is used to donate a phosphate to glucose to produce glucose 6-phosphate. Glycogen can be converted into glucose 6-phosphate as well with the help of glycogen phosphorylase. During energy metabolism, glucose 6-phosphate becomes fructose 6-phosphate. An additional ATP is used to phosphorylate fructose 6-phosphate into fructose 1,6-disphosphate by the help of phosphofructokinase. Fructose 1,6-diphosphate then splits into two phosphorylated molecules with three carbon chains which later degrades into pyruvate. Glycolysis can be literally translated as "sugar splitting". Pyruvate is oxidized to acetyl-CoA and CO2 by the pyruvate dehydrogenase complex (PDC). The PDC contains multiple copies of three enzymes and is located in the mitochondria of eukaryotic cells and in the cytosol of prokaryotes. In the conversion of pyruvate to acetyl-CoA, one molecule of NADH and one molecule of CO2 is formed. This is also called the Krebs cycle or the tricarboxylic acid cycle. When oxygen is present, acetyl-CoA is produced from the pyruvate molecules created from glycolysis. Once acetyl-CoA is formed, aerobic or anaerobic respiration can occur. When oxygen is present, the mitochondria will undergo aerobic respiration which leads to the Krebs cycle. However, if oxygen is not present, fermentation of the pyruvate molecule will occur. In the presence of oxygen, when acetyl-CoA is produced, the molecule then enters the citric acid cycle (Krebs cycle) inside the mitochondrial matrix, and is oxidized to CO2 while at the same time reducing NAD to NADH. NADH can be used by the electron transport chain to create further ATP as part of oxidative phosphorylation. To fully oxidize the equivalent of one glucose molecule, two acetyl-CoA must be metabolized by the Krebs cycle. Two waste products, H2O and CO2, are created during this cycle. The citric acid cycle is an 8-step process involving 18 different enzymes and co-enzymes. During the cycle, acetyl-CoA (2 carbons) + oxaloacetate (4 carbons) yields citrate (6 carbons), which is rearranged to a more reactive form called isocitrate (6 carbons). Isocitrate is modified to become α-ketoglutarate (5 carbons), succinyl-CoA, succinate, fumarate, malate, and, finally, oxaloacetate. The net gain of high-energy compounds from one cycle is 3 NADH, 1 FADH2, and 1 GTP; the GTP may subsequently be used to produce ATP. Thus, the total yield from 1 glucose molecule (2 pyruvate molecules) is 6 NADH, 2 FADH2, and 2 ATP. In eukaryotes, oxidative phosphorylation occurs in the mitochondrial cristae. It comprises the electron transport chain that establishes a proton gradient (chemiosmotic potential) across the boundary of inner membrane by oxidizing the NADH produced from the Krebs cycle. ATP is synthesized by the ATP synthase enzyme when the chemiosmotic gradient is used to drive the phosphorylation of ADP. The electrons are finally transferred to exogenous oxygen and, with the addition of two protons, water is formed. The table below describes the reactions involved when one glucose molecule is fully oxidized into carbon dioxide. It is assumed that all the reduced coenzymes are oxidized by the electron transport chain and used for oxidative phosphorylation. Glycolysis preparatory phase −2 Phosphorylation of glucose and fructose 6-phosphate uses two ATP from the cytoplasm. Total yield 30 or 32 ATP From the complete oxidation of one glucose molecule to carbon dioxide and oxidation of all the reduced coenzymes. Although there is a theoretical yield of 38 ATP molecules per glucose during cellular respiration, such conditions are generally not realized because of losses such as the cost of moving pyruvate (from glycolysis), phosphate, and ADP (substrates for ATP synthesis) into the mitochondria. All are actively transported using carriers that utilize the stored energy in the proton electrochemical gradient. Pyruvate is taken up by a specific, low Km transporter to bring it into the mitochondrial matrix for oxidation by the pyruvate dehydrogenase complex. The phosphate carrier (PiC) mediates the electroneutral exchange (antiport) of phosphate (H2PO4−; Pi) for OH− or symport of phosphate and protons (H+) across the inner membrane, and the driving force for moving phosphate ions into the mitochondria is the proton motive force. The ATP-ADP translocase (also called adenine nucleotide translocase, ANT) is an antiporter and exchanges ADP and ATP across the inner membrane. The driving force is due to the ATP (−4) having a more negative charge than the ADP (−3), and thus it dissipates some of the electrical component of the proton electrochemical gradient. The outcome of these transport processes using the proton electrochemical gradient is that more than 3 H+ are needed to make 1 ATP. Obviously this reduces the theoretical efficiency of the whole process and the likely maximum is closer to 28–30 ATP molecules. In practice the efficiency may be even lower because the inner membrane of the mitochondria is slightly leaky to protons. Other factors may also dissipate the proton gradient creating an apparently leaky mitochondria. An uncoupling protein known as thermogenin is expressed in some cell types and is a channel that can transport protons. When this protein is active in the inner membrane it short circuits the coupling between the electron transport chain and ATP synthesis. The potential energy from the proton gradient is not used to make ATP but generates heat. This is particularly important in brown fat thermogenesis of newborn and hibernating mammals. Stoichiometry of aerobic respiration and most known fermentation types in eucaryotic cell. Numbers in circles indicate counts of carbon atoms in molecules, C6 is glucose C6H12O6, C1 carbon dioxide CO2. Mitochondrial outer membrane is omitted. ATP : NADH+H+ and ATP : FADH2 ratios during the oxidative phosphorylation appear to be not 3 and 2, but 2.5 and 1.5 respectively. Unlike in the substrate-level phosphorylation, the stoichiometry here is difficult to establish. ATP synthase produces 1 ATP / 3 H+. However the exchange of matrix ATP for cytosolic ADP and Pi (antiport with OH− or symport with H+) mediated by ATP–ADP translocase and phosphate carrier consumes 1 H+ / 1 ATP as a result of regeneration of the transmembrane potential changed during this transfer, so the net ratio is 1 ATP : 4 H+. The mitochondrial electron transport chain proton pump transfers across the inner membrane 10 H+ / 1 NADH+H+ (4 + 2 + 4) or 6 H+ / 1 FADH2 (2 + 4). 1.5, as for FADH2, if hydrogen atoms (2H++2e−) are transferred from cytosolic NADH+H+ to mitochondrial FAD by the glycerol phosphate shuttle located in the inner mitochondrial membrane. These figures may still require further tweaking as new structural details become available. The above value of 3 H+/ATP for the synthase assumes that the synthase translocates 9 protons, and produces 3 ATP, per rotation. The number of protons depends on the number of c subunits in the Fo c-ring, and it is now known that this is 10 in yeast Fo and 8 for vertebrates. Including one H+ for the transport reactions, this means that synthesis of one ATP requires 1+10/3=4.33 protons in yeast and 1+8/3 = 3.67 in vertebrates. This would imply that in human mitochondria the 10 protons from oxidizing NADH would produce 2.72 ATP (instead of 2.5) and the 6 protons from oxidizing succinate or ubiquinol would produce 1.64 ATP (instead of 1.5). This is consistent with experimental results within the margin of error described in a recent review. The total ATP yield in ethanol or lactic acid fermentation is only 2 molecules coming from glycolysis, because pyruvate is not transferred to the mitochondrion and finally oxidized to the carbon dioxide (CO2), but reduced to ethanol or lactic acid in the cytoplasm. Without oxygen, pyruvate (pyruvic acid) is not metabolized by cellular respiration but undergoes a process of fermentation. The pyruvate is not transported into the mitochondrion, but remains in the cytoplasm, where it is converted to waste products that may be removed from the cell. This serves the purpose of oxidizing the electron carriers so that they can perform glycolysis again and removing the excess pyruvate. Fermentation oxidizes NADH to NAD+ so it can be re-used in glycolysis. 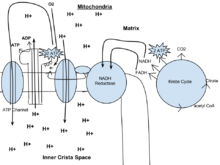 In the absence of oxygen, fermentation prevents the buildup of NADH in the cytoplasm and provides NAD+ for glycolysis. This waste product varies depending on the organism. In skeletal muscles, the waste product is lactic acid. This type of fermentation is called lactic acid fermentation. In strenuous exercise, when energy demands exceed energy supply, the respiratory chain cannot process all of the hydrogen atoms joined by NADH. During anaerobic glycolysis, NAD+ regenerates when pairs of hydrogen combine with pyruvate to form lactate. Lactate formation is catalyzed by lactate dehydrogenase in a reversible reaction. Lactate can also be used as an indirect precursor for liver glycogen. During recovery, when oxygen becomes available, NAD+ attaches to hydrogen from lactate to form ATP. In yeast, the waste products are ethanol and carbon dioxide. This type of fermentation is known as alcoholic or ethanol fermentation. The ATP generated in this process is made by substrate-level phosphorylation, which does not require oxygen. Fermentation is less efficient at using the energy from glucose: only 2 ATP are produced per glucose, compared to the 38 ATP per glucose nominally produced by aerobic respiration. This is because the waste products of fermentation still contain chemical potential energy that can be released by oxidation. Ethanol, for example, can be burned in an internal combustion engine like gasoline. Glycolytic ATP, however, is created more quickly. For prokaryotes to continue a rapid growth rate when they are shifted from an aerobic environment to an anaerobic environment, they must increase the rate of the glycolytic reactions. For multicellular organisms, during short bursts of strenuous activity, muscle cells use fermentation to supplement the ATP production from the slower aerobic respiration, so fermentation may be used by a cell even before the oxygen levels are depleted, as is the case in sports that do not require athletes to pace themselves, such as sprinting. Cellular respiration is the process by which biological fuels are oxidised in the presence of an inorganic electron acceptor (such as oxygen) to produce large amounts of energy, to drive the bulk production of ATP. Anaerobic respiration is used by some microorganisms in which neither oxygen (aerobic respiration) nor pyruvate derivatives (fermentation) is the final electron acceptor. Rather, an inorganic acceptor such as sulfate or nitrate is used. Such organisms are typically found in unusual places such as underwater caves or near hydrothermal vents at the bottom of the ocean. ^ Bailey, Regina. "Cellular Respiration". Archived from the original on 2012-05-05. ^ a b c Rich, P. R. (2003). "The molecular machinery of Keilin's respiratory chain". Biochemical Society Transactions. 31 (Pt 6): 1095–1105. doi:10.1042/BST0311095. PMID 14641005. ^ Reece1 Urry2 Cain3 Wasserman4 Minorsky5 Jackson6, Jane1 Lisa2 Michael3 Steven4 Peter5 Robert6 (2010). Campbell Biology Ninth Edition. Pearson Education, Inc. p. 168. ^ a b "Cellular Respiration" (PDF). Archived (PDF) from the original on 2017-05-10. ^ Porter, R.; Brand, M. (1 September 1995). "Mitochondrial proton conductance and H+/O ratio are independent of electron transport rate in isolated hepatocytes". The Biochemical Journal (Free full text). 310 (Pt 2): 379–382. doi:10.1042/bj3100379. ISSN 0264-6021. PMC 1135905. PMID 7654171. ^ a b c Stryer, Lubert (1995). Biochemistry (fourth ed.). New York – Basingstoke: W. H. Freeman and Company. ISBN 978-0716720096. ^ P.Hinkle (2005). "P/O ratios of mitochondrial oxidative phosphorylation". Biochimica et Biophysica Acta. 1706: 1–11. PMID 15620362.